Made in Tennessee: Manufacturing Milestones offers visitors a look at the history of industry and manufacturing in east Tennessee. Temporary exhibit open November 19, 2015 - February 20, 2016. Cleveland, Tenn. (November 1, 2015)—East Tennessee is a region with a rich and diverse industrial history. Cleveland itself has been home to a number of successful fabricators including Hardwick Woolen Mills, Dixie Foundry, the Cleveland Chair Company, and Magic Chef. More recently, Cleveland and the surrounding region have welcomed other global manufacturers and industrial enterprises. Wacker, Whirlpool, and Volkswagen are only a few of many possible examples. On November 19, 2015 at 6 PM the Museum Center at 5ive Points will welcome the traveling exhibition Made in Tennessee: Manufacturing Milestones to Cleveland with a special members-only opening reception. The exhibit will explore the history of manufacturing and industry in the east Tennessee region, and will open to the general public on November 20. Made in Tennessee: Manufacturing Milestones is a traveling exhibition organized by the East Tennessee Historical Society in Knoxville, Tennessee. The exhibition project was made possible through an educational grant from the Alcoa Foundation to highlight Tennessee’s manufacturing story—past, present, and future. The grant was awarded in honor of Alcoa Tennessee Operations 100th Anniversary and the announcement of its automotive expansion project on May 2, 2013. Additional support comes from the Tennessee Valley Authority. The exhibit will be on view through February 20, 2015. Read more about the exhibit at East Tennessee Historical Society website. Curious Collections: Oddities of the Museum Center offers visitors a look at unknown pieces of Cleveland’s material heritage. Cleveland, Tenn. (June 25, 2015)—In the eye of the general public, museums are usually perceived as guardians of objects from the past; public servants entrusted with shepherding valuable artifacts, once common but now festooned with the cobwebs of time. In order to preserve historic objects, most museums are only able to exhibit a small portion of these relics at any one time. The Museum Center at 5ive Points is no exception. Many objects appear strange and unknown – pieces that are odd, obscure, and make you say, “Huh? !” From railroader jacks to torsion balances to carbide mining lamps, the Museum has a large collection of items which have fallen out of common use, often being replaced by smaller and more accurate digital and electronic counterparts. As a result, many of these objects have been forgotten over the years. On Thursday, July 16, at 6 PM, at a special members-only opening reception, the Museum will bring to light these treasures of the past and put them on display for the community to see. The exhibit will open to the general public on July 17. This is sure to be an exhibit that appeals to local Clevelanders and area history buffs alike. For some of these objects, it will be the first time since the opening of the Museum that they will be on public view. After the close of the exhibit, these unique artifacts will be returned to storage, so visitors won’t want to miss the chance to see them during this limited run. The family-friendly exhibit will have an educational focus. Many of the objects will feature accompanying clues, giving visitors hints about the object’s use and history, and inviting them to guess what it is. Fun for children and adults alike, this exhibit will invite learning through observation. “We hope visitors will leave the exhibit with a fuller appreciation for the complexities and richness of our material heritage,” says Curator of Collections, Sam Rumschlag. The exhibit will close on November 7. The elder man in Comanche traditional clothing is Ta-Ten-e-quer. His wife, Ta-Tat-ty, also wears Comanche clothing. Their niece (center) is Wife-per, also known as Frances E. Wright. Her father was a Buffalo Soldier who deserted and married into the Comanches. Henry (center left) and Lorenzano (center right) are the sons of Frances, who married an African American man. Cleveland, Tennessee (April 21, 2015): On April 23, 2015 the Museum Center at 5ive Points premieres the Smithsonian traveling exhibition IndiVisible: African-Native American Lives in the Americas with a special members-only opening reception at 6 p.m. The exhibit opens to the public the following day, April 24. The exhibit focuses on the seldom-viewed history and complex lives of people of dual African American and Native American ancestry. Through the themes of policy, community, creative resistance and lifeways, the exhibition tells stories of cultural integration and diffusion as well as the struggle to define and preserve identity. “IndiVisible,” produced by the National Museum of the American Indian (NMAI) in collaboration with the National Museum of African American History and Culture (NMAAHC) and the Smithsonian Institution Traveling Exhibition Service (SITES), will remain on view through July 3 and will then continue to travel to museums around the nation. Since the arrival of Christopher Columbus in the Americas, the lives of Native and African peoples have been closely intertwined. From pre-colonial times, they intermarried, established communities and shared their lives and traditions. But racially motivated laws oppressed and excluded them. Blended tribes worked to preserve their land and rebelled against displacement. Their survival strategies included involvement in social movements, joining together to fight oppressive conditions and regaining economic sustainability. Their unique African-Native American cultural practices such as food ways, language, writing, music, dance and the visual arts have thrived. An online version of the exhibition and full national tour schedule are available at www.americanindian.si.edu/exhibitions/indivisible. This exhibit is proudly sponsored by First Tennessee, a regional bank serving families and businesses through about 170 locations. The Smithsonian’s National Museum of the American Indian is an institution of living cultures dedicated to advancing knowledge and understanding of the life, languages, literature, history and arts of the Native peoples of the Western Hemisphere. SITES has been sharing the wealth of Smithsonian collections and research programs with millions of people outside Washington, D.C. for more than 50 years. SITES connects Americans to their shared cultural heritage through a wide range of exhibitions about art, science and history, which are shown wherever people live, work and play. Exhibition descriptions and tour schedules are available at www.sites.si.edu. The Museum Center at 5ive Points tells the story of the Ocoee region through compelling exhibitions and dynamic educational programming that promotes history, culture, and preservation. Hours are Tuesday-Friday, 10 a.m.-5 p.m., and Saturday 10 a.m.-3 p.m. The museum is closed Sunday, Monday, and on select holidays. Admission is $5 for adults, $4 for seniors and students, and free for children under 5. Members of the Museum receive free admission. Scarab discovered during the 2013 season featuring a falcon-headed sphinx with an ankh (life) sign before and a meter (god) sign above. 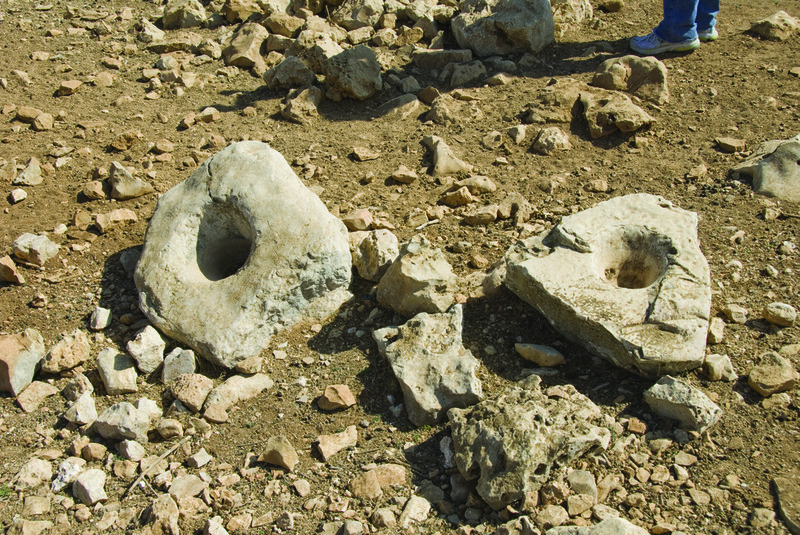 Two of the three large socket stones found for the city gate. Entrance to a "mikva" bath used for ritual purification. Both the Jewish purification baths and baptism of early Christians were by immersion and involved walking into and then out of the pool of collected water. Numerous sling stones were found around the the 15th century BC gate. A skilled warrior could send a stone flying 100-150 miles per hour. Cleveland, Tenn. (March 16, 2015) —The Museum Center at 5ive Points is opening their newest exhibition, Khirbet el-Maqatir: History of a Biblical Site on Thursday, March 19, 2015 at 6:00 p.m. with a members-only opening reception. Lee University's Dr. Brian Peterson, Field Archaeologist at Khirbet el-Maqatir, will explain the significance of the the objects and how they are being recovered. Dr. Peterson is a Lee University professor and an expert in Old Testament history who has been a collaborator on the project since 2010 and has personally experienced some of its most significant finds. The exhibit will showcase the ongoing archaeological research of the Khirbet el-Maqatir archaeological site and will feature more than 40 artifacts which have been recovered from the site and have graciously been loaned by the Civil Administration for Judea and Samaria for exhibition in the United States. Following the members-only preview event, the exhibit will open to the general public on March 20. The site of Khirbet el-Maqatir is widely believed to be the site of the Biblical city of Ai, which is described in Joshua 7-8. As such, the arrival of the collection to Cleveland represents an exciting opportunity for local history enthusiasts and students of Biblical history to experience first-hand the material culture and cultural development of the world in which Biblical figures lived and thrived. The exhibit will also feature original memorabilia, field notes, and materials from local Lee University students who have worked with the project throughout its development, highlighting the local as well as the international significance of the work. In addition to the artifacts themselves, the Museum Center at 5ive Points will also host a variety of interpretive programming in an effort to connect the ongoing work in the Holy Land to the local community and allow interested people to experience the Biblical world more fully. The Museum Center will host a series of lectures by archaeologists and academics involved with the work at Khirbet el-Maqatir to discuss the historical value of the objects uncovered. This summer, archaeology camps for local children will be hosted which will focus on the day-to-day practice of archaeology by project researchers. The camps will be led by local Lee University students who have backgrounds in professional archaeological research. These events are intended to help families achieve a greater understanding of the world of professional archaeology and how it is relevant to understanding our past and present. Field trip and group tours will be available on a scheduled basis by contacting the Museum Center. Khirbet el-Maqatir: History of a Biblical Site is made possibly by the Civil Administration of Judea and Samaria as well as the Associates for Biblical Research. Major funding for bringing this exhibit to Cleveland was provided by Lee University. Additional support was provided by Landmark Insurance Group, First Baptist Cleveland, Ralph Buckner Funeral Home & Crematory, Church of God, and the United Way of Bradley County. The exhibit will open to the public on Friday, March 20 and run through December 26. More information, including information on membership and related programming, can be found online by visiting www.museumcenter.org. Cleveland, Tenn. (January 16, 2015) – The Museum Center at 5ive Points announces Brew-Ha-Ha: Winterfest coming Saturday February 21, 4:00pm – 8:00pm. The event features local beer and food from Cleveland, TN and surrounding areas. Beer tastings from distributors and home-brewers combined with food samples from restaurants and caterers makes this a must-do event for an otherwise dreary, wintry February. BREW-HA-HA was first held at the Museum Center in August of 2012. The event exhibited local home-brewers and beer distributors and hosted over 150 attendees. For 2015, we are adding food vendors and expecting attendance of over 300 people! Brewers on tap for the day include Barley Mob Brewers, Big River Brewing, Black Fox Bier Works, Chattanooga Brewing Company, Chris Strain, Ocoee Brewing, TNT Brewing, and the new Mash & Hops. Carter Distributing and Tarver Distributing will also be onsite dispensing dozens of local and national craft beers. Food vendors include Bald Headed Bistro, CBC-Cleveland, Chili’s, Cooke’s, Five Point Square, Gabriel’s Pizza, Impressions Catering, Mars Chocolate, and Village Bake Shop. Tickets are $40 for Museum Members; $45 for non-Members. Ticket price includes a tasting mug along with all the beer you can drink and all the food you can eat! The event is age 21 and up only. ID must be presented at the door. For more information or to purchase tickets, visit www.museumcenter.org/brewhaha. The Museum Center at 5ive Points tells the story of the Ocoee region through compelling exhibitions and dynamic educational programming that promotes history, culture, and preservation. The Museum Store features arts, crafts, and books from select artists, craftsman, and authors from within a 200-mile radius. Hours are Tuesday-Friday, 10 a.m.-5 p.m., and Saturday 10 a.m.-3 p.m. The museum is closed Sunday, Monday, and on select holidays. Admission is $5 for adults, $4 for seniors and students, and free for children under 5. Members of the Museum receive free admission. Group rates are available and the Museum’s facilities can be rented year-round for weddings and special events. For further information call 423-339-5745, or visit www.museumcenter.org.